Korean traditional dance has a rich history of culture and storytelling that continues today in many parts of the country. From ancient folk dancing to modern dance styles, the Korean people have long celebrated dance as part of their cultural heritage. The earliest use of dance in Korea began about five thousand years ago with shamanistic rituals. 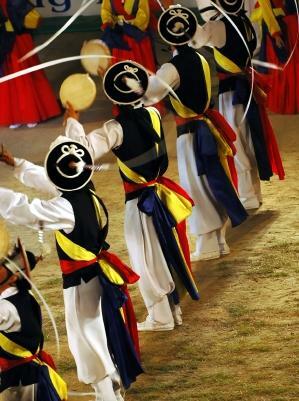 Shamanism incorporates the beliefs and practices of the indigenous people in Korea, and both religious views and dance styles were unique to each village in these early years. Usually, each region would have its own local gods, and the Shamans worked as part of funeral services to guide spirits into heaven. The dances, such as the Tang'ol from the south, were choreographed with the goal of entertaining a god or goddess. Many, such as the fan dance, have roots in the original shaman dances. Today, other Korean traditional dance choreography is still performed by farmers and folk dancing groups. Props are often used to accentuate the beauty and drama of Korean dance, and everything from hats to swords may be seen on stage. The majority of Korean dances that are considered to be traditional include some sort of storyline representing the Korean life. For example, in the Ghost dance, the dancer reunites with a dead spouse, and then experiences grief and loss through the second goodbye. In contrast, the Great Drum Dance features a larger-than-life drum that is often bigger than the dancer. The drum represents temptation of a pure religious figure, such as a Korean monk, and eventually he gives in to the desire of the drum beat. When Japan ruled Korea from 1910 until 1945, many of these celebrated dances were pushed out of society and forgotten. Most dance academies were shut down, and local dance traditions faltered. When Korea was liberated from Japan, a small group of dancers reinvented the traditional choreography based upon what was remembered. At first, these dances were preserved in secret, and eventually dance enjoyed a new life in modern Korean culture. The storytelling aspect remained stronger than ever, and top dancers in Korea are now given the obligation to teach the traditional dances to younger students. Outside of their ancient dance forms, which have been recreated and preserved, Koreans enjoy mainstream forms of dance as well. This is especially true of modern dance, which has enjoyed great success in Korea. The current generation of dance students often study modern dance along with ballet and folk dancing, and the movement was established by Sin Cha Hong - a noted choreographer from South Korea. Recognized as the nation's best dancing performing artist, she founded a dance company in New York City before returning to South Korea to raise up young dancers from her homeland. Korean dancers today study traditional dance at local studios, as well as learning from their older relatives and friends. Since many dances are "passed down", schoolchildren often learn them in preparation for holidays and festivals, while more formal dance forms like modern dance and ballet are reserved for private study. Although many new dance forms exist and thrive in Korea, the traditional dances are still remembered and celebrated by many, and are an important part of Asian dance culture and history.